When we talk about more megapixels for a sensor our first thought is that we have higher resolution which in some sense is true but really what you get is an increased field of view (FOV) given the same optics, scene and pixel size. Field of view is the angular extent of the image scene and resolution is the number of pixels on target. See the figures below for examples. The first shows a patterned semiconductor wafer and the relative area or FOV each of several cameras sees given the same optics, distance from the sample, etc. Note that these are Adimec 4 (Q-4), 5 (N-5), 12 (Q-12), 25 (S-25), and 50 (S-50) megapixel cameras. For some of these cameras there is a small difference in pixel size as well which can affect resolution a bit but for our illustration the comparison is adequate. 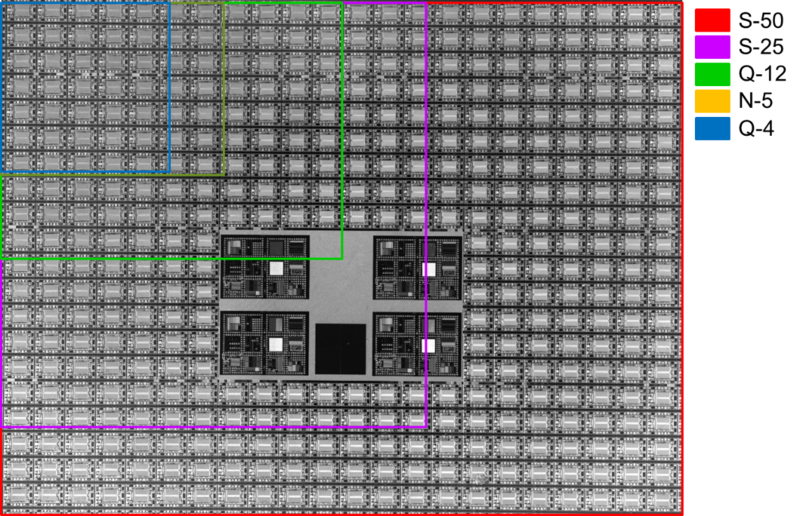 The following figure shows the actual FOV for three of those cameras looking at a printed circuit board assembly (PCBA). You can see the relative field of view for each camera, again with the same optics and the same distance from the camera. Clearly more of the PCBA is shown as the “resolution” increases. 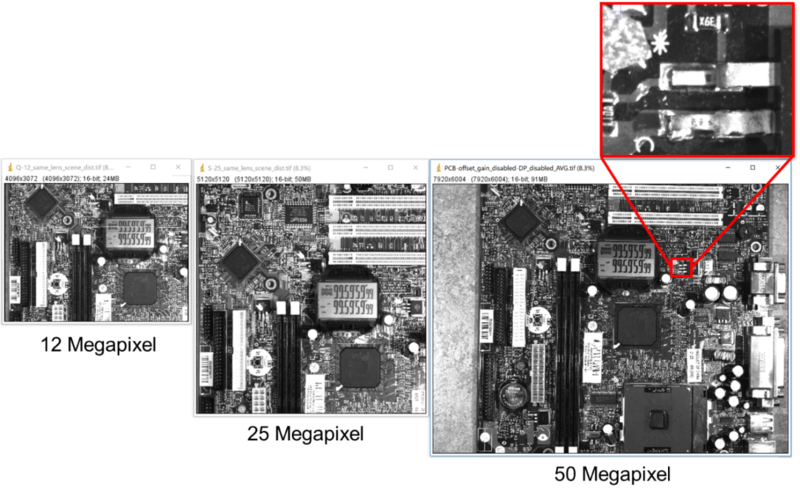 The inset from the above shows a measure of true spatial resolution, clearly showing the blown component in some detail, from a macro view of the PCBA image a micro view is available to observe. This is an interesting consequence of increased resolution. You can change the optics or the distance to the scene and get more pixels on target which indeed yields more spatial resolution. You have reduced the field of view and thus gotten more pixels across the field. Another way to get increased resolution is to choose a camera with the same optical format but with smaller pixel size. For a constant field of view and constant sensor area with reduced pixel size you get increased resolution, again because you have more pixels on target. When you have more pixels on target you can take a wide image capture of an object and then digitally zoom into the scene to uncover details that otherwise would be washed out, or out of focus, with a lower resolution sensor. Ultimately you will see pixilation of the image with any resolution camera but the more pixels per unit area you have the farther you can zoom without pixilation. 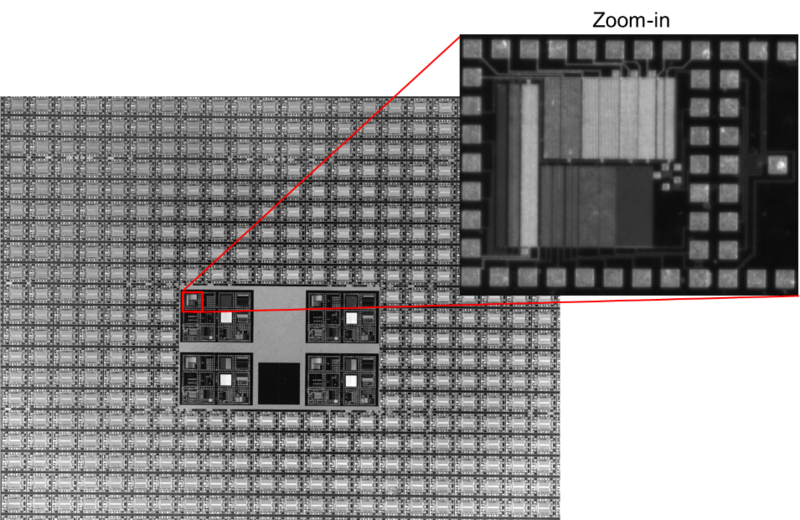 The following image shows a patterned semiconductor wafer with a digital zoom into one die region showing the detail possible with the 50-megapixel sensor (S-50A30 coming soon). Note the detail on the devices in the cell with no pixilation. In summary, more pixels over the same field of view is increased resolution in its truest sense. More pixels with the same optics at the same distance gives greater field of view. More pixels on target allows you to digitally zoom deeper into the image without pixilation, going from macro to micro without a zoom lens.